After a record-breaking year for sea turtle nest numbers at Cape Romain National Wildlife Refuge in 2015, the Refuge again has cause for celebration. The S.C. Department of Natural Resources (DNR) is happy to announce the first sea turtle nest of the year was laid on Lighthouse Island, located in the Refuge, the night of May 5. Refuge staff member Jerry Tupacz found the distinctive marks of a sea turtle crawl on the beach leading to a freshly laid nest. The nest came close on the heels of Georgia's first sea turtle nest, recorded several days prior on Cumberland Island, and marks the beginning of a season that DNR biologists expect will be similar to last year's. The earliest recorded nest on record was laid April 29 in 2002, but typically they're laid from May 7-10. In 2015, the South Carolina nest total reached 5,111, just shy of the statewide record set in 2013 by 5,194 nests. “Due to unseasonably warm water temperatures over the winter, it was no surprise when sea turtles were spotted in our waters in early March. We were expecting an early start to nesting and are looking forward to another successful year,” said Michelle Pate, DNR biologist and sea turtle program coordinator. Volunteers from 30 different nest protection programs will spend the next several months patrolling South Carolina's beaches each morning for crawls, the telltale tracks left by a sea turtle as it trundles ashore. Between bright lights, hazardous debris, and natural or man-made obstacles, beaches can be treacherous places for nesting females. Incubating eggs face additional threats, including erosive high tides and predators such as coyotes and raccoons. Sea turtle clutches average 120 eggs and hatch after about 60 days. Nesting females may remain in South Carolina waters and continue to nest every two weeks, laying up to six nests per season. Throughout this stressful time, the turtles also abstain from eating. Because nesting exacts a high energy toll on the large reptiles, female sea turtles do not come ashore to lay eggs every year. This cyclical nesting pattern results in fewer sea turtle nests in some years than in others. In 2014, for instance, sea turtles laid just 2,097 nests along the South Carolina coast. Ongoing genetic analysis represents an exciting avenue of research in which DNR biologists continue to participate with a multi-state team led by Dr. Brian Shamblin of the University of Georgia. By collecting genetic samples from every nest identified in South Carolina, researchers can pinpoint the individual females that laid each nest – data that allows scientists to gauge the health of the overall nesting population and map family trees for the region's sea turtles. 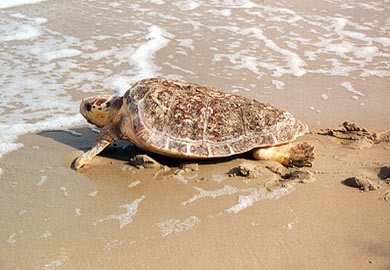 Four sea turtle species nest on South Carolina beaches: loggerheads, greens, Kemp's ridleys, and leatherbacks. Loggerhead nests comprise the vast majority of the state's total number each year. All four sea turtle species are classified as endangered or threatened and are protected under the Endangered Species Act in addition to local and state ordinances. Individuals that violate federal law by harming or interfering with sea turtles or their nests can be subject to civil penalties of up to $25,000 and up to a year's imprisonment. South Carolina beachgoers can help the state's sea turtles by keeping beaches free of holes, trash, and obstructions, turning beachfront lights out (or closing window blinds) to avoid disorienting turtles, and giving all sea turtles and nests a wide and respectful berth when encountered on the beach. Report sightings of live, healthy turtles to DNR here.